The Perth Mint in Australia is well known for producing some of the finest bullion and proof silver coins in the world, such as the highly coveted Australian Koala and Australia Kookaburra coins. Now, a brand-new sovereign bullion coin is offered by the mint, and features the nation’s most iconic native species. 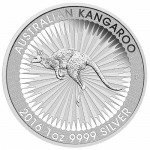 The all-new 2016 1 oz Silver Australian Kangaroo is available on Silver.com right now in a special Monster Box selection. 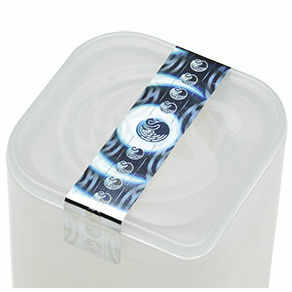 Ships in a sealed Perth Mint Monster Box containing 250 coins. Individual coins have a face value of $1 (AUD), fully backed by Australia’s government. 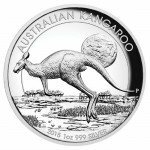 First year of production for Silver Australian Kangaroo coins! Includes micro-laser engraved security features. 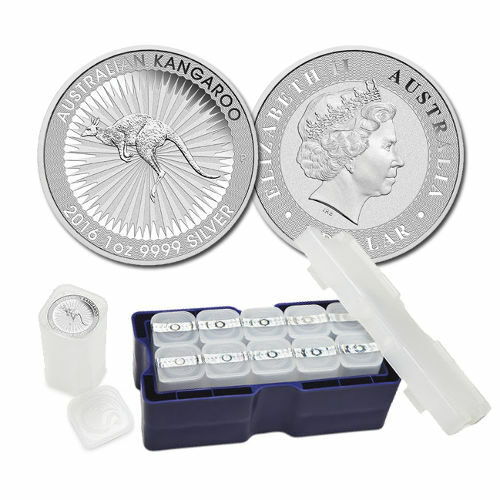 In this unique Silver.com product listing, the 2016 1 oz Silver Australian Kangaroo Coin is available in a Monster Box containing a total of 250 individual coins. Each of the coins in the Monster Box has a face value of $1 (AUD) and consists of .9999 pure silver, equaling 250 troy ounces of .9999 pure silver with a face value of $250 (AUD). 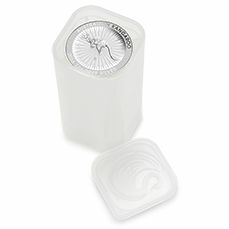 The individual coins in this shipment are packaged into acrylic Mint Tubes by the Perth Mint. Each Monster Box contains 10 separate acrylic tubes. 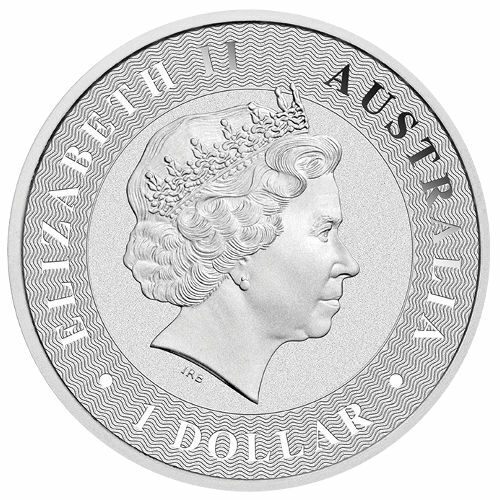 For additional security, these coins bear a micro-laser engraved “A” within the first letter of the word “Australia” on the reverse face. This small “A” is only visible under magnification. 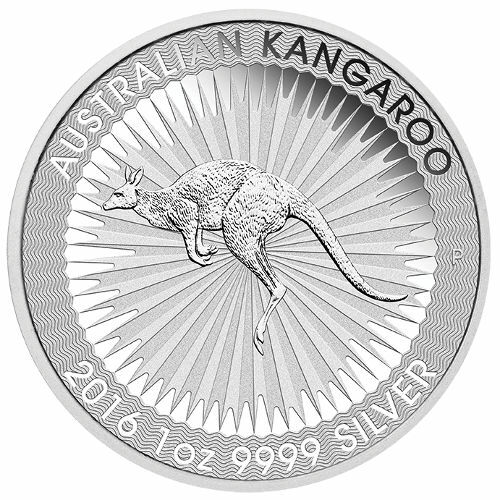 On the reverse is the first-ever Silver Australian Kangaroo design. The animal is featured as it would appear bounding across the Australian Outback, with its powerful hind legs propelling it and its muscular tail helping it maintain its balance. Above it are the words “Australian Kangaroo,” while the year of minting, weight, purity, and metal content are engraved below. The obverse features Ian Rank-Broadley’s right-profile portrait of England’s Queen Elizabeth II. Her Majesty’s effigy was created in 1998, and represents the fourth-generation image of the Queen to appear on commonwealth currency since she ascended to the throne in 1952. Australia’s Perth Mint is a state-owned entity of the government of Western Australia. Founded in 1898, it remained in British control until it was transferred to the local government in 1970. For those with questions, Silver.com associates are standing by to help. You can reach us at 888-989-7223, connect with us online via web chat, or send us an email. If you are looking for similar products, check out our selection of Perth Silver Coins.